The Ukraine Handball Federation are fined following shortcomings in the 2011 Women's 19 European Championship qualification. 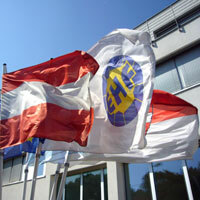 On 11 July 2011 the EHF Arbitration Tribunal made a decision in the case concerning the Ukraine Handball Federation. The Ukraine Handball Federation hosted the Qualification tournament of the 2011 Women's 19 European Championship – Group 5 in Kherson. After the tournament, legal proceedings were initiated by the EHF due to a last minute change of team accommodation by the organiser, without prior approval of the EHF, to a hotel not fulfilling the required EHF standards. Besides the violation of the EHF Championship Regulations, the EHF Arbitration Tribunal found that the Ukraine Handball Federation offered difficult competition conditions to the participating delegations, detrimental to fairness, image and reputation of EHF competitions. A fine of € 1,800 and a one-year suspension from organising EHF handball competitions or events for the Younger Age Category was imposed on the organiser. In line with the EHF Arbitration Regulations, the Ukraine Handball Federation may file a statement of claim at the EHF Court of Arbitration within 21 days from the date of the decision.